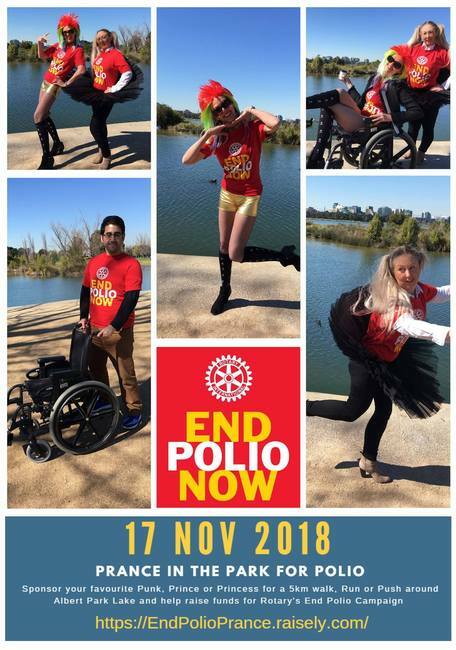 It's a "prance" around Albert Park Lake by 100 'prancers' dressed as either Punks' Princes or Princesses on Saturday 17th November 2018, raising money for Rotary's International project "End Polio Now". We're inviting 100 Rotarians to join us is walk, stroll or prance around Albert Park Lake. For an extra sponsorship fee, prancers in impractical footwear or moon boots will be able to join the "End Polio Push" and be pushed around the 5km course in a donated wheelchair! Don't forget to grab yourself a special edition End Polio Now T-shirt via Donations page. Join the Southbank Prancers - click here!